More than 19,100 people were killed in car accidents in the first half of the year, which represents a nine percent increase compared to the first six months of 2015, according to an analysis by the National Safety Council (NSC). Traffic fatalities were at a historic low just five years ago, but they have been trending upward since 2014, as these deaths were 18 percent higher in the first six months of 2015 than they were in 2014. Moreover, there was an eight percent increase in traffic deaths from 2014 to 2015, which is the largest one-year increase in car accident fatalities in 50 years. The NSC estimates that 100 people die in car accidents on a daily basis. Fatal and non-fatal car accidents cost Americans approximately $205 billion — a number our personal injury lawyers here don’t take lightly. NSC officials believe that the increase in deaths is attributed to Americans driving more, as the improved economy has fueled lower gas prices. There was a 3.3 percent increase in the number of miles Americans drove in the first six months of the year. Florida, Georgia and California have seen the most significant increases in motor vehicle deaths since 2014, followed closely by North Carolina, Illinois and Kentucky. Get enough sleep and do not drive while fatigued. 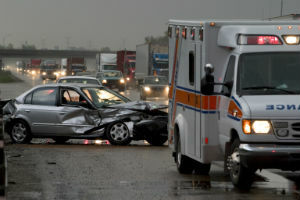 If you lost a loved one in a car accident, the auto accident attorneys in Tulsa at The Edwards Law Firm may be able to obtain compensation for your loss. We have a long track record of recovering just compensation for victims of car accidents. Our attorneys are aggressive negotiators who will not settle for less compensation than our clients deserve. We have years of experience negotiating with insurance companies that try very hard to avoid compensating accident victims. Schedule your free consultation with our personal injury lawyers today.